Nottinghamshire and England cricketer Samit Patel visited Wolverhampton Cricket Club as Waitrose’s commitment to grassroots cricket in local communities continued. 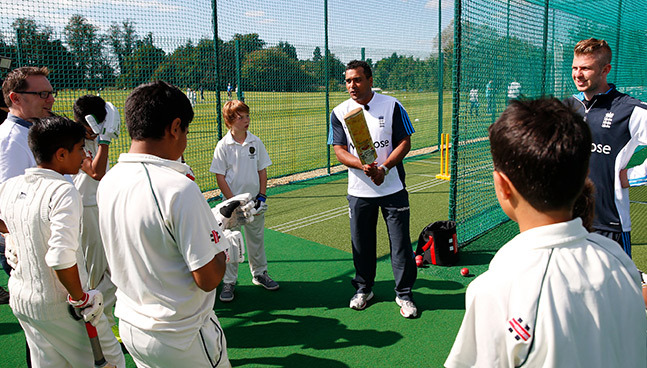 On the day the international season in the UK drew to a close, Patel was at Wolverhampton as part of an ECB initiative to boost cricket participation at recreational cricket clubs through the hosting of a Club Open Day, in partnership with Waitrose. Junior cricketers were given the chance to take part in training sessions overseen by Patel, with the Nottinghamshire star also given the chance to watch an England v India match made up of local players. Representatives from the England Visually Impaired and Physical Disability squads attended the Open Day, in the hope of inspiring new players to play the game. Patel also teamed up with the players and Baroness Rachel Heyhoe-Flint to officially open a new decking area for spectators with wheelchairs to be able to watch the action, an important development for the club as they continue their drive to become a focus for disabled cricket in the local area. As part of the day, Patel tried out bowling while wearing visually impaired glasses and had huge admiration for those who play the game with a disability. He said: “It was really quite difficult and so it is hats off to the guys who bowl while physically impaired. The ball has bells and it would be a great achievement to bowl consistently with it. “Open days are all about cricket clubs opening their doors and raising some buzz in the local community. It’s a brilliant way to get people down to their local clubs and encourage them to play. Wolverhampton has been selected as a ‘focus’ club as part of an ECB initiative to boost cricket participation through the holding of club open days funded partly by sponsors Waitrose. More than 1,000 clubs across the country have held open days this summer with Waitrose donating £100 worth of food and drink. Mike Elphick, Wolverhampton’s community development officer, said: “We were selected because of our focus on bringing together the many ethnic groups that play cricket at our club. Also we launched the club as the centre for disabled cricket in South Staffs at our NatWest Cricket Force event in April and wanted to showcase a cricket match involving players from Beacon Centre For The Blind and Lancashire Lions Visually Impaired Team. Other entertainment on the day saw the NatWest International T20 against India from Edgbaston live on the big screen with the Sky Sports cameras present filming a feature on Open Days. Wolverhampton Wanderers Mascot “Wolfie” was also in attendance adding to the family fun filled nature of the event.